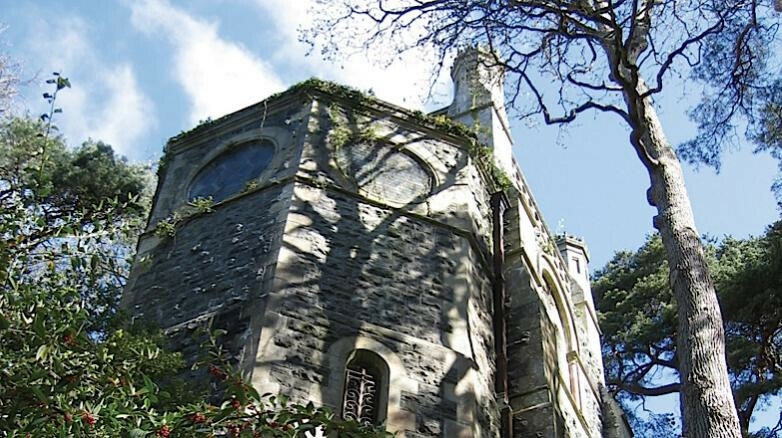 The Poem is a quaintly-named mausoleum in the beautiful setting of Bodnant Garden. It was built by Henry Davis Pochin, a wealthy industrial chemist and founder of the present garden, and although Henry has descendants that still own and live in Bodnant House, the garden was given over to the care of the National Trust by his grandson, the 2nd Lord Aberconway, in 1949. Bodnant is in an exceptionally picturesque position on the east side of the Conwy valley, with magnificent views westwards towards Snowdonia. The Poem, built in 1882, sits on an outcrop of rock at the end of the valley known as the Dell. Grade II-listed for architectural interest and with an unusually sumptuous interior, it was designed by architects W J Green of London; whilst the spectacular marble inside was sculpted by Samuel Barfield of Leicester. Pochin bought the estate in 1874, and set about remodelling the house and continuing to develop the garden established by previous owner, Colonel Forbes. When Pochin died in 1895, the estate passed to his daughter, Lady Aberconway, who, along with her son Henry Duncan McLaren, continued the work that her father had initiated, in turn passing responsibility to Charles McLaren, the 3rd Lord Aberconway. The estate is now owned by his younger son, Michael McLaren QC, who also manages the 80-acre Bodnant Garden on behalf of the National Trust. Maysand carried out a 20-week restoration of The Poem after being appointed by architects Brock Carmichael who have been overseeing National Trust projects for 17 years. The Poem is a storeyed, square tower in neo-Norman style, constructed of local blue/grey limestone with yellow sandstone dressings. There is a lower level apse at the rear and a single storey boiler room to the North West elevation. The roof is slate, in a shallow pyramidal style with a parapet and octagonal turrets at each corner. Above the arched entrance with voussoirs supported on columns of red marble, is a sandstone band inscribed ‘The Poem’ in raised decorative lettering. 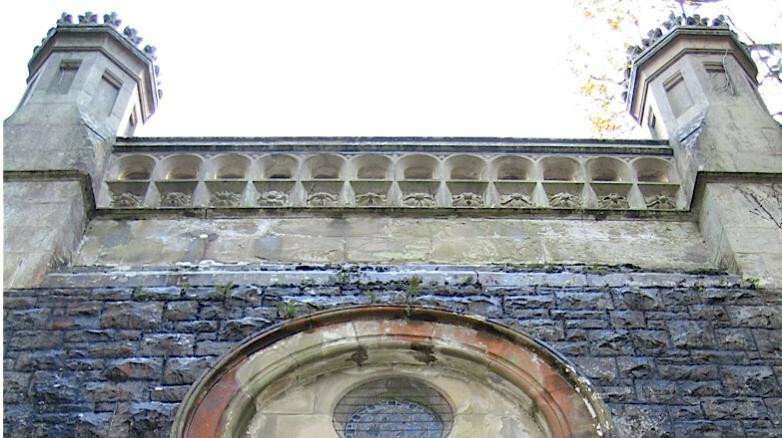 Maysand’s task was to restore the exterior, which has suffered some erosion and distress due to weather and age, including masonry, the roof, decorative architectural features such as the raised lettering frieze, and an ornate, but dilapidated, dovecote. We replaced the roof with new Penrhyn slate, and provided new lead lined gutters to the parapet to replace those removed and replaced with bitumen felt back in the 1960s. Maysand’s timber experts dealt with rot in the rafter feet and wall plates, splicing or replacing where necessary. Defective profiled sandstone and ashlar blocks was stripped out and replaced and a new sandstone frieze carved to replicate the lettering ‘The Poem’ exactly as the original. For that Maysand sourced Woodkirk stone from Yorkshire as the best available match for The Poem’s existing sandstone. The currently uninhabited dovecote was rebuilt in its entirety and reinstated above the boiler house. One of the biggest challenges was access to The Poem, since all materials had to be transported across two fields via dumper truck and a 4-wheel drive quad bike. “It was not a huge or necessarily technically challenging project, but The Poem has some quirky architectural features, and, as a National Trust property, is, deservedly, a national treasure to be preserved for our heritage” says Maysand’s Bryn Lisle.